It seems hard to fathom that scientific progress has advanced to a point where it’s suddenly possible for people to undertake something as complicated as gene therapy outside the safety and confines of a well-funded lab, but it has. In just the past few months we’ve seen not one, but two examples of people pursuing unregulated gene therapy. That’s right, people are genetically modifying their bodies in DIY labs and friend’s apartments. Now, the largest organization of scientists who work in gene and cell therapy have come out against DIY gene therapies. A statement from the American Society of Gene and Cell Therapy comes on the heels of a stern warning against DIY gene therapy from the US Food and Drug Administration. For years, when it came to biohacking, regulators and establishment science have mainly looked the other way. That seems to be changing. “As the largest professional society representing gene and cell therapy in the world, ASGCT does not support the practice of unregulated gene therapies because such procedures are potentially dangerous and highly unlikely to provide therapeutic benefit,” the organization said in its statement. 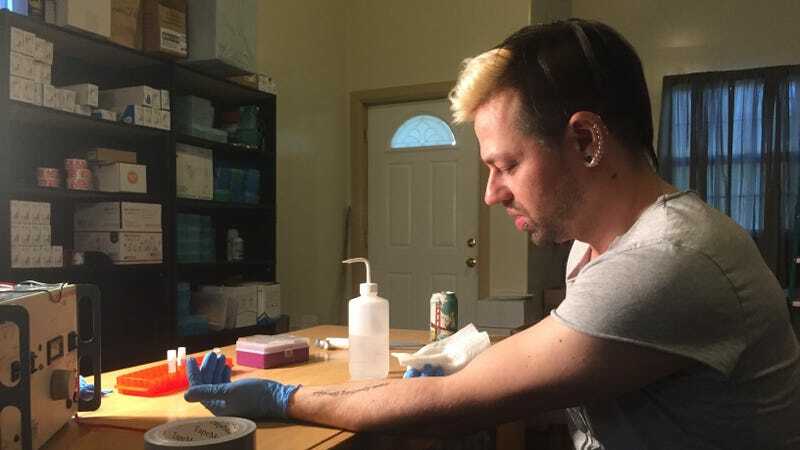 The statement, the organization said in an email, was in response to several stories reported by Gizmodo, among them the story of a well-known biohacker injecting himself with the gene-editing tool CRISPR at a conference and a 27-year-old software engineer administering an untested HIV therapy while livestreaming on Facebook. Seemingly in response to those two public performances, the FDA issued a statement noting that selling supplies intended for DIY gene therapy is illegal and actually performing it is unsafe. The ASGCT followed suit, arguing that DIY attempts at gene therapy are simply unsafe. Neither the FDA nor a consortium of scientists seem likely to dissuade those on the frontline of do-it-yourself science. When asked about the statement, Josiah Zayner, the guy who injected himself with CRISPR at a conference, said the ASGCT’s statement didn’t even seem like that stern of a warning. “It didn’t outright condemn the stuff people were doing,” he told Gizmodo.